Revolution Recovery has three locations and more than 100 employees. 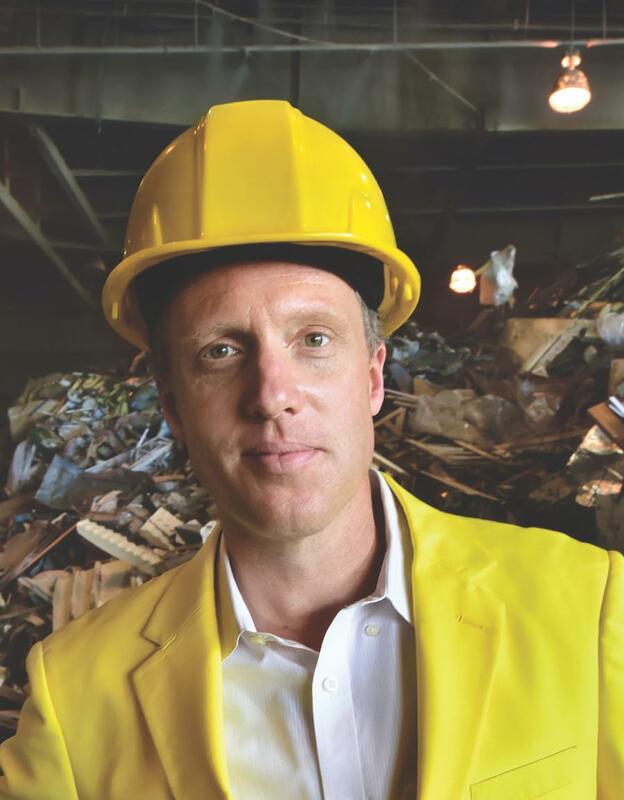 When Jon Wybar and his business partner ventured into the recycling industry in 2004, they started with one location, their own two hands and a lot of hard work. The initial goal was only to recycle drywall, as that was the inspiration behind their company: Revolution Recovery. "It was a little bit just common sense," said Wyba. "When they hang drywall, there's a lot of cut-offs, and it looks like just board. It's cut, it's square, it's clean, and that's just going to the landfill, whole loads of it. It just seems insane, and it is." Their business was quick to experience success and they swiftly evolved into recycling many types of building materials at their first location in Philadelphia, Pa. Today, the company has three locations and more than 100 employees. "I would like to think we grew based on survival of the fittest, hard work and business savvy," Wybar said. Revolution Recovery's mission is to keep recyclable materials out of sanitary landfills. It takes in a variety of materials from construction sites — both new construction and renovation — as well as demolition and manufacturing sites. The materials may include: wood, pallets, drywall cut offs, metals, concrete, brick, asphalt, cardboard and plastic. The material is delivered in a container — which businesses can rent from Revolution Recovery — and the driver will unload the materials on the ground. 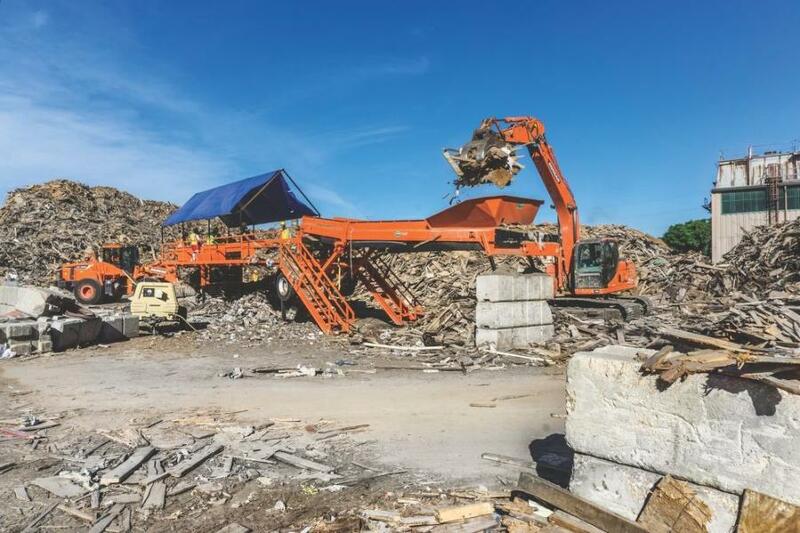 The material then goes through a pre-sort, where crawler excavator operators extract bulky, undesirable items such as tarps or sheets of plastic. The remaining material is then pushed to another operator who feeds it through a finger screen before it takes a ride up an incline conveyer. The material's final destination is on a horizontal conveyor, where employees pick out and sort the various materials. "Most of the materials there we can bale — like the cardboard, the plastic, the vinyl — and we can sell them," said Nick Grovola, plant manager at the New Castle, Del., location. 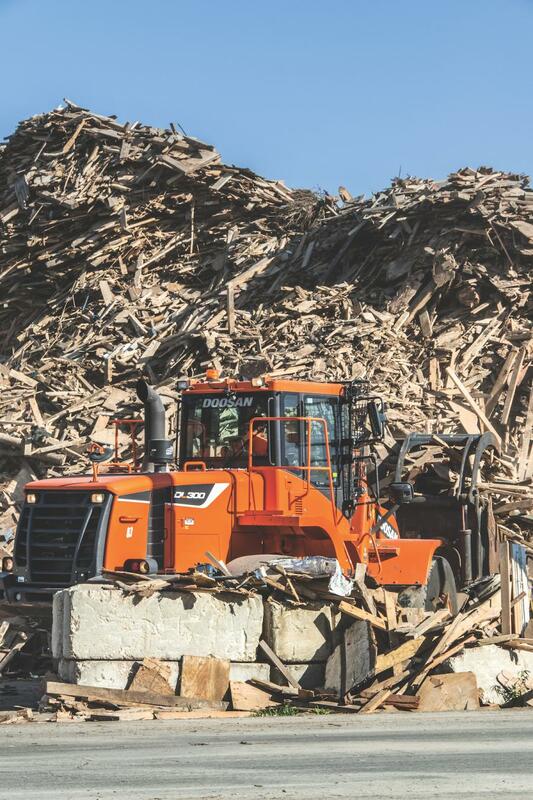 "The non-ferrous metals we actually grade on site, and a lot of those get baled as well. We crush the concrete and then we can sell the crushed concrete material. "We also recycle shingles, so we'll take the shingles and we'll separate them. And then those get sent to a facility that will crush the shingles, and they can sell that product back to asphalt manufacturers. Wood gets turned into mulch or a bedding product. The drywall is sent on and goes through a process to make it useable as a soil amendment." Grovola oversees the day-to-day operations. 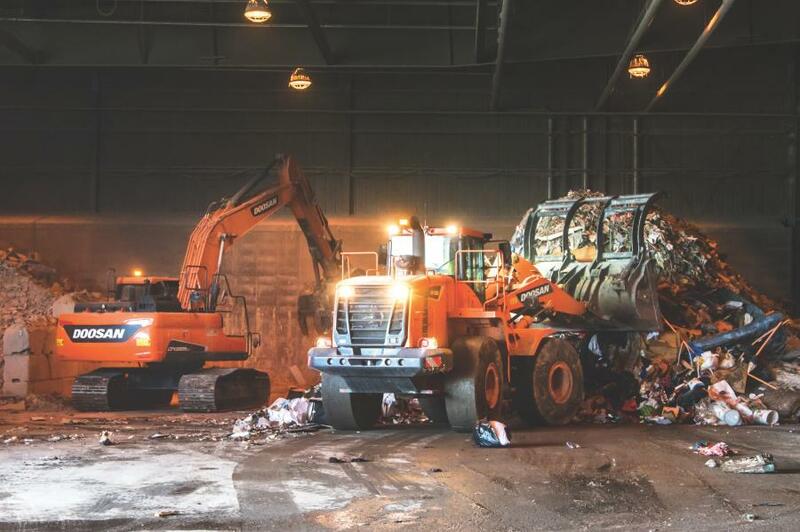 He said, on average, the company takes in approximately 450 tons of material a day in Philadelphia and New Castle. Roughly 50 percent is recycled, 25 percent is screenings or fines, and 25 percent goes to a sanitary landfill. To help keep their locations running smoothly and to keep up with demand, powerful and reliable equipment is a necessity. 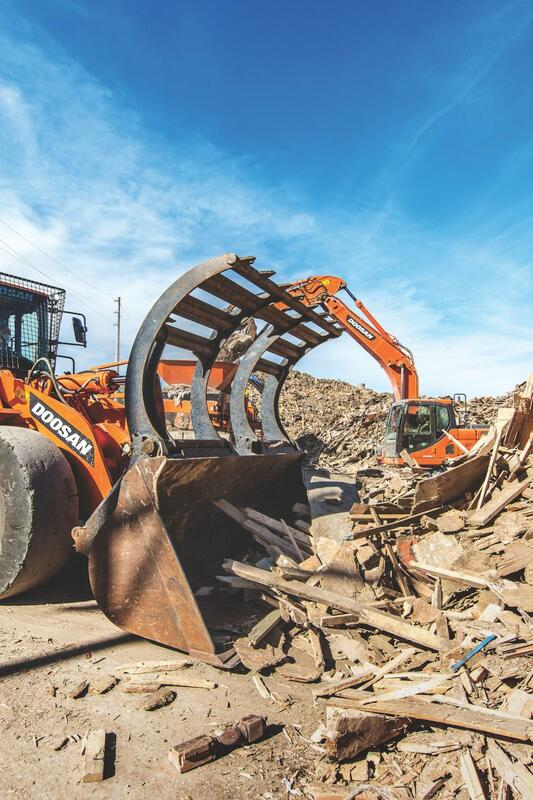 Both the Philadelphia and New Castle locations rely on four Doosan wheel loaders and five Doosan crawler excavators — each equipped with grapple attachments — working up to 10 hours a day. The excavators are responsible for loading trailers, pre-sorting material and crushing up larger material to fit on the sorting screen. The wheel loader operators make sure the material gets from point A to point B, load the fine screens and load material to be baled. Wybar and Grovola purchased the Doosan wheel loaders and excavators from the local heavy equipment dealer — Best Line Equipment. Wybar's original business partner has since moved on to pursue other opportunities, but he has had no problem continuing to grow the business. The company expanded into New Castle in April 2012 when a request for proposal fell into the owner's lap. The second location flourished, growing to equal the size of Philadelphia. Inspired by Delaware's success, the company recently opened its newest location in Allentown, Pa.
"The rapid growth in Delaware opened our eyes to the need for geographic expansion and markets with no recycling options for construction and demolition," Wybar said. These expansions have not only made the company more financially successful, but they've also given employees room to grow. With more work to be done, employees have the opportunity to fully develop their skills and improve their quality of work. "Our workforce is young and ambitious, company growth creates opportunity and experience for them," Wybar said. "Their growth and development are the key to improvement." Looking towards the future, the company has no immediate plans to open additional locations. They have, however, conducted preliminary market research. "There are still staggering amounts of raw construction debris including precious resources going into landfills. Our mission is to change this," Wybar said. Revolution Recovery is helping keep unnecessary waste out of landfills on the East Coast, but given China's recent actions relating to the waste and recycling industry and their announcement earlier this year, Revolution Recovery may see an influx in the amount of material they take in. The Chinese government has been phasing out scrap material imports since 2017 due to environmental implications. More than 20 categories of recyclable materials were prohibited as of Jan. 1, 2018, and stricter quality standards were put into effect on March 1. Following those previous policies, on April 19, 2018, China released another announcement banning more than 30 types of scrap material imports. More than 10 of these bans are effective as of Dec. 31, 2018, and the remaining as of Dec. 31, 2019. The question now is how this will affect the waste and recycling industry in the United States. Wybar offered some insight as a business owner in the industry. "The industry coddled the consumer with simple single stream recycling at too high of a cost to quality," he said. "The low quality created a dependence on China and limited domestic capacity. For real change, the industry has to push back on the consumer for higher quality at origin. The good news is the millennials are green and the generation behind them promises to be more so. Help is on the way." Safety is a top priority at Revolution Recovery, according to Plant Manager Nick Grovola. He said at the company's three facilities there is a lot of action between the trucks, wheel loaders and excavators, and his employees have to stay on top of everything they're doing. Grovola requires monthly safety meetings where employees provide feedback about operations and safety. And Grovola has a safety coordinator at the New Castle facility. "I'm responsible for all these people and the last thing I want is for someone to get hurt," Grovola said.